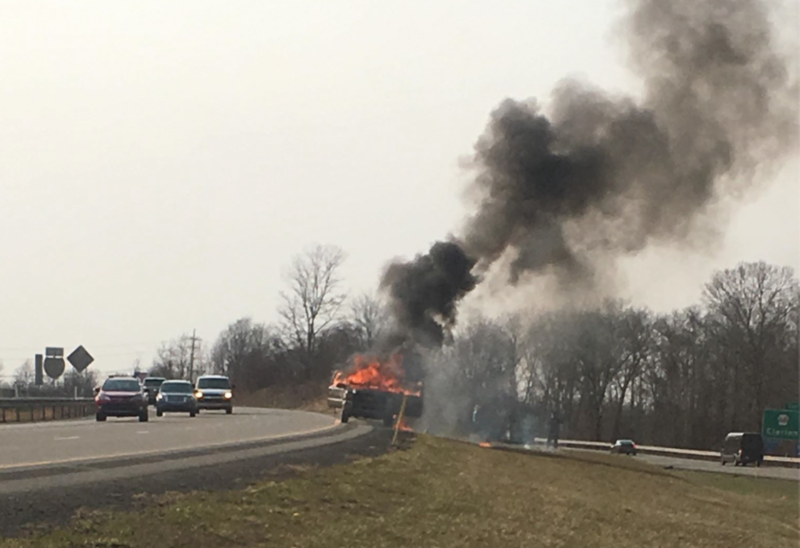 CLARION TWP., Pa. (EYT) – State Police in Clarion have released details surrounding an April 13 vehicle fire on Interstate 80 in Clarion Township. According to Tpr. Hageter, the incident occurred around 5:26 p.m. when 44-year-old Daniel R. Delp, of Falls Creek, was traveling east near mile marker 62.5 and his 2005 Ford F-350 caught on fire. After pulling onto the shoulder of the roadway, Delp and a passenger – 26-year-old Cristy A. Miller of Brookville – quickly exited the vehicle. Within minutes, Delp’s truck was completely engulfed in flames. Clarion Fire & Hose Company No. 1 was dispatched and quickly extinguished the fire.